The knowledge of the skeletal maturation and the stage of the growth of the patients seeking orthodontic treatment are of great value in planning efficient orthodontic therapy. However, different craniofacial structures of patient show variation in growth potential. 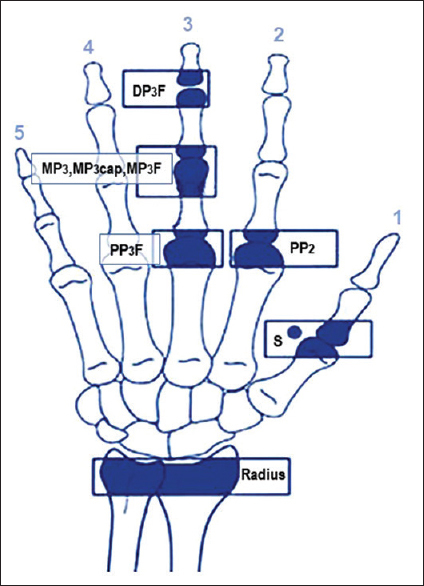 The routine use of hand-wrist radiograph for growth prediction exposes the patient to extra radiation. Cervical vertebrae in the lateral cephalograph have been recommended as an alternative method. The pubertal growth spurt is a vital period in the orthodontic treatment and should be kept in mind when planning orthodontic treatment in growing children. One of the main objectives of taking hand and wrist radiograph is to determine the amount of growth and get used of it in patients with skeletal discrepancy during adolescence. Further, this will help in the selection of the appliances required, the course of the treatment and the retention after active orthodontic therapy. Objective: The main objective of this study is to assess about the awareness, attitude, and practice regarding disinfection and handling of extracted teeth among the students of a dental college in Odisha, India. Materials and Methods: The survey was done with a self-designed questionnaire distributed among the students of a dental college in Odisha, India. Data analysis was done using the Statistical Package for the Social Sciences Software (SPSS for Windows, Version 16.0., Released 2007, Chicago, SPSS Inc.) and the results obtained. Results: Of the many methods available, the safest and practical methods to sterilize and disinfect the extracted human teeth could be autoclaving, submersion in 10% formalin and 5.25% sodium hypochlorite solutions. In addition, it was found that there is a significant need to educate the potential handlers of such extracted teeth about the latest statuary protocol and guidelines. Conclusion: Most of the participants in the study were aware of the established safety protocols regarding how to handle the pathogenic specimens and were putting in practice those standardized guidelines. But still another good number of handlers need to change their casual attitude while following the safety guidelines so as to protect themselves, others and the environment from the pathogenic clinical specimens. Aims and Objectives: The aims of this study were to determine oral health-related quality of life (OHRQoL) among elderly people aged 65 and above years from Hafar Al-Batin area, Saudi Arabia, by utilizing Arabic version of Geriatric Oral Health Assessment Index (GOHAI-Ar). Materials and Methods: This was a cross-sectional study undertaken from October 2017 to December 2017. 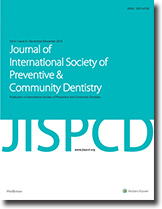 A convenience sampling methodology was employed to select the elderly patients aged ≥65 years attending dental clinics of primary health-care centers in five different regions of the Hafar Al-Batin, Saudi Arabia. OHRQoL of the participants was measured using the Saudi Arabian version of GOHAI-Ar. The oral examinations performed to record a total number of remaining natural teeth, complete and removable partial dentures, and fixed partial dentures. Descriptive and inferential statistics were performed. Results: A total of 200 elderly participants (M = 157 and F = 43) having mean age (± standard error [SE]) was 69.26 (±0.34) years, participated in the study. Mean ± SE of GOHAI-Ar was 27.68 ± 0.54, physical function 9.12 ± 0.26, pain and discomfort (6.87 ± 0.18), and psychological discomfort (11.69 ± 0.25). Remaining natural teeth and prosthodontic status significantly correlated with pain and discomfort. The presence of prosthesis was found to influence the psychological function. Gender and prosthodontic statuses were found to have significant correlation with OHRQoL. Conclusion: Poor OHRQoL among elderly from Hafar Al-Batin city was found, and presence dental prosthesis showed a positive impact on OHRQoL. Aim and Objectives: To evaluate the apical fill in relation to apical leakage using three different obturating techniques – Single Cone, Ultrafil 3D, and lateral condensation. Materials and Methods: Sixty-six mandibular single-rooted premolar teeth were selected and were randomly assigned into three different groups of obturating techniques. The canals were prepared using 0.4/25 HyFlex CM (Coltene Endo) rotary system file and obturated with corresponding HyFlex CM Single Cone, Ultrafil 3D injectable technique, and lateral condensation. AH Plus (Dentsply, Detrey) has been used as the sealer. Twenty teeth each were assigned to the three experimental groups, and six teeth were used as positive and negative controls (3 in each group). Fluid filtration technique was used to determine the amount of apical leakage. The evaluation was done for 8 min at the interval of every 2 min. The same teeth were sectioned and a spectroscopic examination was done at 2 mm and 4 mm distance from the apices. The obtained data were statistically analyzed using analysis of variance test followed by post hoc turkeys test for multiple comparisons. Results: The mean apical leakage was maximum for lateral condensation when compared to the Single Cone and Ultrafil 3D. The amount of apical fill at 2 mm and at 4 mm was found to be more in the Single Cone than the other two techniques. Conclusion: The present study concluded that Single Cone obturation technique exhibited more gutta-percha filled area in the canal which led to decreased apical leakage than Ultrafil 3D and lateral condensation techniques, proving to be more effective in achieving a complete three-dimensional apical seal. Aim: This study aimed to assess the level of knowledge and attitudes for pit and fissure sealants among undergraduate Indian dental students. 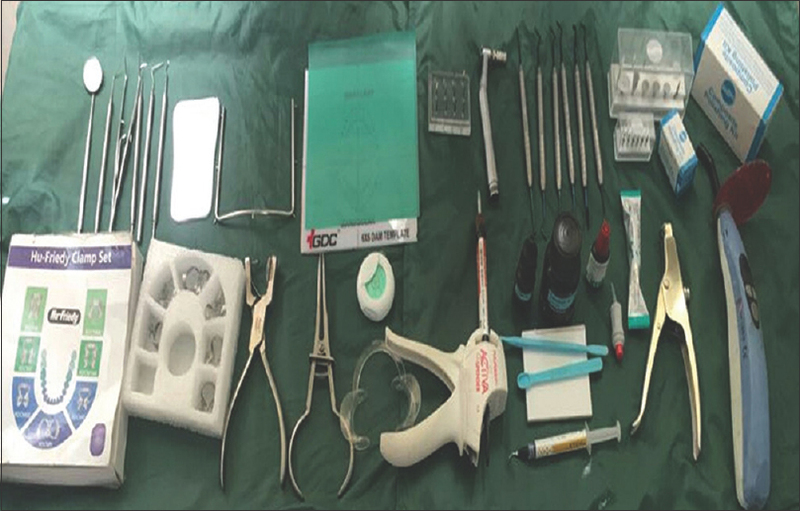 Materials and Methods: A modified questionnaire consisting of 24 items was distributed to 280 undergraduate dental students comprising males and females of different years at MNR Dental College, Sangareddy, India. Descriptive statistics and Chi-square/Fisher's exact tests were used for statistical analysis. The data were computationally tested using Statistical Package for the Social Sciences (SPSS) Version 20, IBM SPSS Statistics software for Windows, Armonk, NY, USA. 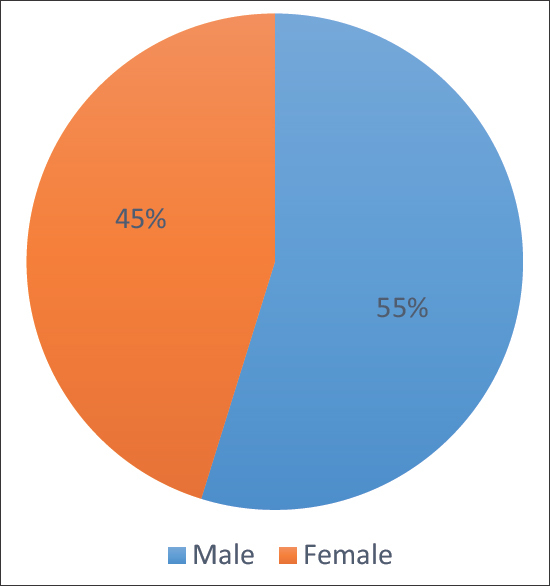 Results: With the response rate at 100%, most of the respondents, i.e., 70.4%, were females and the remaining 29.6% were male. Regarding the level of study, 20.8% were in 3rd year, 43.8% in the 4th year, and 16.8% were in 5th year (internship). The respondents showed a reasonable level of knowledge about sealants, mostly being good with the theoretical concepts of the sealants. On the other hand, respondents showed insufficient knowledge about sealants in the clinical practice. Conclusion: Although a high proportion of undergraduate dental students showed adequate knowledge about dental sealants, there is a lag in putting that knowledge into work during the clinical practice. These findings suggest an urgent need of dental schools to include and/or update their curriculum regarding fissure sealants to reflect modern dental education that concentrates on evidence-based practice in pediatric dentistry and improve the dental health among the future generations by reducing the incidence of caries. Aims and Objective: The aim of this study is to investigate the expression of p53 protein and Ki-67 antigen in normal oral mucosa and oral leukoplakia with different grades of dysplasia using immunohistochemistry and to clarify the correlation of the expression of these cell cycle regulatory proteins. Materials and Methods: A total of 20 archival tissue blocks obtained from our department which were diagnosed as mild (n = 5), moderate (n = 5), and severe dysplasia (n = 5) with normal mucosa (n = 5) as a control. Positivity of Ki-67 and p53 was analyzed using Statistical Package for the Social Sciences (IBM Corp. Released 2013. IBM SPSS Statistics for Windows, Version 22.0 Armonk, NY:IBM Corp) software. Results: All samples showed positive staining for p53 and Ki-67. Statistically significant difference (P < 0.05) was seen between the frequency of occurrence of p53 and Ki-67 pattern of expression among all the groups. The intensity of staining was mild to intense in basal layer as there was a progression toward the severity of the disease. Almost 81.1% correlation existed between p53 and Ki-67 with high correlation and marked relationship. Conclusion: Oral leukoplakia represents the most common oral potentially malignant disorder (OPMD). Molecular biological markers such as p53 and Ki-67 are considered to be of great value in the diagnosis and prognostic evaluation of OPMD. Our results emphasize the potential use of p53 protein and Ki-67 antigen as significant molecular markers for early detection of PMDs and its risk of developing oral squamous cell carcinoma. Objective: The objective of the study is to investigate the effect of infection control barrier (ICB) and curing time on irradiance of light cure units (LCUs). Methods: Irradiance (mW/cm2) of the LCUs at a government dental school were recorded with and without ICB at 0 (T0), 10 (T10), and 20 (T20) seconds using a digital radiometer. Data were analyzed using IBM® SPSS® Statistics Version 17 for Windows software for the analysis of variance and Bonferroni methods at 0.05 significance level. Results: Using ICB resulted in a statistically significant effect on the irradiance mean (P < 0.01). A significant difference existed between the four different brands of LCUs at different time intervals, irrespective of the use of ICB. At T0 and T10, the mean output of Acteon mini-light-emitting diode (LED) was significantly higher than that of either the Kerr Demi Ultra or the Kavo Polylux II. At T20, E-Morlit's mean irradiance was significantly higher than that of Kerr Demi Ultra, which in turn was significantly higher than that of the Kavo PolyLux II. The mean irradiance of the LEDs was significantly higher than that of the halogens irrespective of barrier placement and at all-time points. Conclusion: The ICB used in this study resulted in a statistically significant reduction in the irradiance output. No significant difference in the irradiance was found at different curing time intervals for the tested units regardless of ICB usage. Aims and Objectives: This research is intended to observe the influence of menopause on saliva and dental health. Salivary flow rate, pH of stimulated whole saliva, oral hygiene status, dental caries status, and periodontal status were evaluated in frequently menstruating and postmenopausal womankind. Materials and Methods: A cross-sectional study was conducted on forty healthy postmenopausal women (case group) and forty regularly menstruating healthy women (control group), who were selected from the Outpatient Department of Dr. Syamala Reddy Dental College and Hospital, Bengaluru. None of them had any systemic disease and not under any medication. Participants were asked to chew on an elastic band of standardized size. The flow rate was measured as ml/min. Salivary pH was measured using pH strips. Oral Hygiene Index-simplified (OHI-S), Decayed Missing and Filled Teeth (DMFT index), Community Periodontal Index (CPI), and Loss of Attachment (LOA) were assessed clinically. The results were analyzed with the Chi-square test and Student's t-test (P < 0.05). Results: Salivary pH and flow rate in the case cluster were considerably lesser when related to the control group (P < 0.001). OHI-S, DMFT, CPI, and LOA were found to be greater in postmenopausal women when related to the control group (P < 0.001). Conclusion: Here exists a noticeable diminution in the salivary pH and flow rate in postmenopausal womanhood which in turn leads to increased OHI-S, DMFT, CPI, and LOA. The study has presented that the significance of preventive dentistry upsurges with aging in females. Aim: Comparative evaluation of postoperative sensitivity (POS) among three bulk fill restorative materials (Cention N, Equia Forte, Activa™ Bioactive restorative) in Class I posterior restorations. Materials and Methods: One hundred and forty-four patients having occlusal caries were arbitrarily selected and divided into three groups. Standardized Class I cavity was prepared and restored with Cention N, Equia forte, and Activa™ Bioactive restorative material. POS of restored tooth was assessed with a standardized cold test and air stimulus by air blow from the air syringe. Patient responses were assessed at an interval of 24 h, 1 week, and 1 month using a visual analog scale. Statistical analysis was performed using paired t-test, independent t-test, one-way ANOVA test, and Tukey's post hoc test using SPSS 11.0 program (SPSS Inc., Chicago, IL, USA) for windows. Results: The statistical analysis showed a significant difference in the clinical evaluation of POS at 24 h interval among three groups (Cention N, Activa™ Bioactive Restorative, Equia forte). However, following 1 week and 1 month, there is no significant difference in Group C (Activa™ Bioactive Restorative). Conclusion: POS was seen more in Cention N contrast to Equia forte and Activa™ bioactive restorative material. Aim and Objective: The aim of the current study is to evaluate the knowledge of dental practitioners in Saudi Arabia about managing physically challenged patients. Materials and Methods: A cross-sectional digitalized survey was conducted among dental practitioners including both male and female. The questionnaire consisted of 20 items which included years of dental practice, previous experience treating a physically challenged patient, and any difficulties handling such cases. The survey was distributed through E-mail, social media official accounts. Chi-square test was used to investigate associations between factors using SPSS Pc+ version 22.0 statistical software package (Chicago, IL. WA). Results: A total of 2030 dental practitioners participated in this study. The majority (91.0%) reported that their university was not good enough in preparing them to treat a physically challenged patient and they need to have more knowledge to treat them. Hearing impairment reported as the hardest to manage. 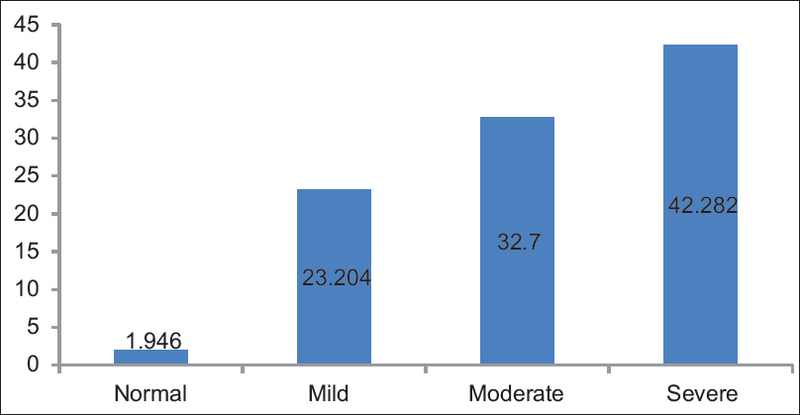 Two-third (66.6%) reported that their clinic does not have the facilities to help in managing such patients. Statistically, a significant association was found between gender and most of the items of perception (P < 0.05). Conclusions: Treating physically challenged patients considered as a challenge for most of the dental practitioners in Saudi Arabia. Dental school should provide more courses and training programs about how to manage physically challenged patients. The use of communicating technology tools is highly recommended to manage those patients. Aims and Objectives: The aim of visual systematic screening is early identification of oral cancer (OC) precursor lesion. OC mortality improves when cancer is identified at early stages. This is important in patients whose lifestyle choices render them at higher risk of developing OC. This study described the prevalence of OC screening among smokers and nonsmokers in Kuwait and ascertained demographic predictors. Materials and Methods: This cross-sectional study utilized a self-administered online survey in English and Arabic through Survey Monkey® and disseminated using the social networking app “WhatsApp.” The survey included 21 questions on demographics, smoking status, and knowledge of OC. Screening questions were adopted from the Maryland Cancer Screening and Risk Behavior Survey. Data were analyzed using the computer software “Statistical Package for Social Sciences, SPSS version 24.0” (IBM Corp, Armonk, NY, USA). Results: The study included 404 Kuwaiti respondents, 311 (77%) nonsmokers and 93 (23%) smokers. Prevalence of OC screening was 7.2, 7.7% among nonsmokers and 5.4% in smokers. Only 36.6% were aware of OC, with more nonsmokers (38.9%) than smokers (29%). Logistic regression revealed twice more males likely to go for screening than females and with the likelihood of those being in the age group of 25–44 years four times more (P < 0.012) than other age groups. Conclusion: There was low prevalence of screening and poor awareness of OC among sampled. Increased efforts are needed by health professionals to spread awareness and improve knowledge on OC and demand the inclusion of screening during their routine and opportunistic oral examinations. Aims and Objectives: The colonization of the respiratory pathogens has been found in the oral cavity. In the high-risk patients for lung infection; the risk factor is the high colonization of the respiratory pathogens in the oral cavity. The present study was performed with an aim to investigate the relationship between periodontal health and respiratory diseases. Material and Methods: The present cross-sectional study was conducted in the individuals who were attending the outpatient department of dentistry and those who signed the informed consent to participate in the study. A total of 198 patients were included in the present study. Ninety-nine patients with respiratory diseases were included in the test group and 99 patients with normal pulmonary function were added in the control group. Spirometry was used for the confirmation of the lung diseases. We had assessed the clinical parameters such as plaque index, gingival index, loss of attachment, and community periodontal index with the help of SPSS software 15 and compared between cases and controls. Results: The mean age of control patients were 35.12 and for respiratory patients was 43.32. There were 65 males and 34 females in case group with respiratory diseases. The controls consisted of 63 males and 36 females. The high scores for various gingival and periodontal indexes in respiratory patients confirmed more periodontal destruction with respect to that group, compared to the nonrespiratory group. Conclusion: It is concluded that a strong association between periodontitis and chronic obstructive pulmonary disease was found. The assessment of the risk factors along with patient education regarding the risk should be done so that suitable intervention strategies can be implemented. Aims and Objectives: The parent's oral health knowledge has a great influence on their children, so the aim of the study was to estimate the parental knowledge about oral health care and its influence in maintaining the diet and hygiene practices on their children and also to access how the demographic variables will influence them in taking their child to dental visits. Materials and Methods: The self-administered pretested questionnaire was distributed among Saudi parents whose children are in the age group of 2–6 years vising primary health care centers (PHCCs) in Riyadh city. The PHCCs were divided into five zones (Central, East, West, South, and North). 240–250 samples were randomly selected from each zone to reach the prescribed sample size of 1200. The survey will be composed of self-administered pretested questionnaires seeking for age, gender, educational level, and their financial status followed by 26 questions related to parent knowledge about oral health (14), dietary (5), and hygiene (7) practices what they implement on their child. The data collected were analyzed using SPSS software SPSS 25.0 (SPSS, Inc., Chicago, IL, USA). Results: Demographic information showed that the average age of the parents who participated in the study is 32.2 years. The mothers were 942 (75.7%) and fathers were 303 (24.3%) among the participants. The mean knowledge score among the mothers (34.85) is slightly greater than fathers (34.76). Similar results with dietary and hygiene practices were not statistically significant (>0.05). The parents having more than one child have better knowledge, of which the parents with more than three children have better scores, which is statistically significant. 69.3% of the parents prefer taking to a dentist only when they have a problem. Moreover, these findings found to be statistically significant (P < 0.05). Conclusion: Parents should get access to oral health knowledge to put in practice on their children so as to influence them in gaining better oral health.